We all have that one horse that was too good to be true. They were the saint of all horses past, present, future. And inevitably the good ones pass on, we’ve seen a lot of that in the horse industry this year, the good ones passing on. It’s tragic, but there are many ways to remember them to help their legacy live on. Halter Shadow Box: Placing their halter, stall name plate and your favorite picture of them is a great way to display their legacy in the barn or your home. Tail Shadow Box: It can be very common practice to cut the tail of your horse as a way of holding on to them and their legacy. 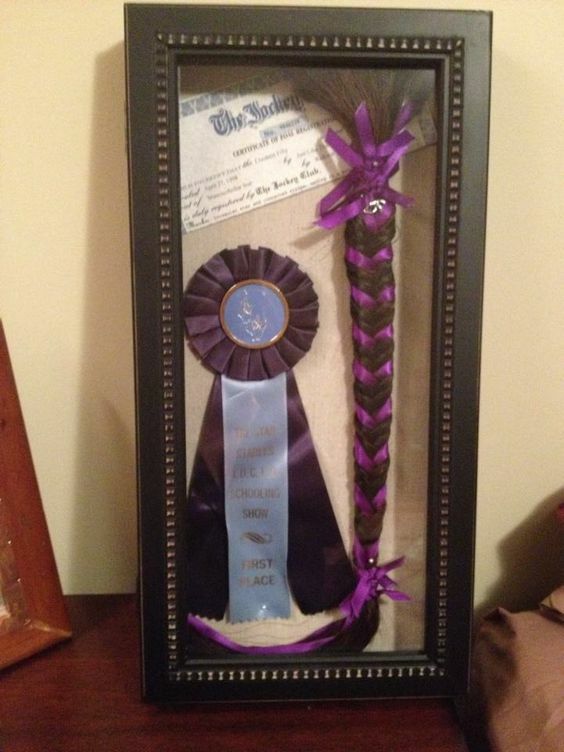 This shadow box shows how you can display their tail, with registration papers and a ribbon or other accomplishment of theirs. Keychains/Bracelets: This is a super easy DIY project to tackle on your own, or there are a number of companies who can make a memorable keepsake that will last for years to come. Shoe Keepsake: Call me odd, but I still have the first pair of shoes my horse “Ollie” ever wore. He has worn dozens of pairs of shoes since then, but there’s something to be said having those first pair of shoes. You can paint and seal the shoes, or simply put a clear coat over the shoe to keep it from rusting. There are countless ways that we remember the greats, to keep their legacy living strong. “When a rider gazes into a horses eyes they find a part of themselves thought never to be found” –Unknown.